PRODUCT: #14 X 2" HWH SMS WITH SEALING WASHER, TYPE-A MILLED POINT, PAINTED TOP, #A3531-GBF PAINTED. 250/BAG. Price/BAG. 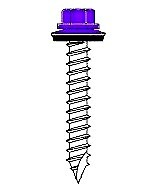 * Self-tapping type-A milled sharp point screw. OPTIONS: Available in #14, 1" through 3" lengths.